When preparing for foaling season, it is recommended that mare owners have certain equipment and supplies on hand in preparation for a routine foaling or if an emergency situation occurs. 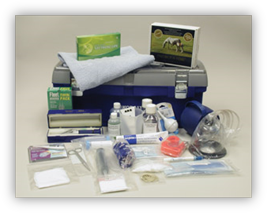 The ARS Foaling Kits contain all the essential supplies needed for routine management of the late-term mare and newborn foal, conveniently packaged in a portable box. Each kit includes the "Techniques In Equine Reproduction" book which includes chapters on pregnant mares, foaling and foal care. To help insure a successful birth it is important to work out a foaling plan with your veterinarian in advance. It is recommended that owners receive specific instructions or training from their regular veterinarian regarding appropriate use of obstetrical equipment, recognition of complications of the foaling process, and medical care of the newborn foal. The Deluxe Foaling Kit (AFK-201) includes all of the items listed below. For mare owners who already have a Foal Resuscitator and Equine Colostrum Refractometer, the ARS Standard Foaling Kit (AFK-101) is available. 1 Cord, Nylon, 1/8" DIA, 48" Length (Nominal) X X CN-48/6 Nylon Cord, 1/8" x 48", 6 per pkg. 1 Scissors, Stainless Steel, Mayo, 7" X X CS-101 Scissors, Stainless Steel, Mayo, 7"
CS2-101/4 Chlorhexidine Scrub, 2%, 1 Gal. 4 NI Test Submission Form X X NA Download Form here. 1 Nylon Obstetrical Strap, 60" X X NOS-60 Nylon Obstetrical Strap, 60"